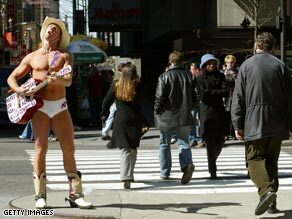 NEW YORK (CNN) -- An underpants-clad New York guitarist known as the "Naked Cowboy" can proceed with his trademark infringement lawsuit against the maker of M&Ms and its ad agency, a New York judge has ruled. The Naked Cowboy is part of the scenery at New York's Times Square. Robert Burck has become a fixture in Times Square for playing the guitar dressed in a white cowboy hat, white cowboy boots and white underpants while tourists pose with him for pictures and slip money into his boots. In February, the street performer filed a lawsuit against Mars Inc. and Chute Gerdeman Inc., after they released a video billboard showing a guitar-playing blue M&M dressed in a white cowboy hat, cowboy boots and underpants. The company also ran print ads showing a similar yellow M&M. Burck says in his lawsuit that he has registered trademarks to the Naked Cowboy name and likeness. U.S. District Judge Denny Chin ruled Monday that the trademark infringement claim can proceed. Chin dismissed the privacy claim, however, saying New York law protects only the "name, portrait, or picture of a living person" and not a character "created or a role performed by a living person," according to a statement from the court. Lawyers for Mars and Chute Gerdeman did not return calls for comment. Mars issued a statement saying, "we do not comment on matters of litigation. However, as a good corporate citizen, Mars will handle this matter accordingly." Burck said he is looking forward to pursuing the matter. "I have spent 10 years in every kind of weather and going through the legal, step by step [process of getting a trademark]," Burck said. "It is imperative that damages are pushed so ... an example will be set." He is seeking up to $100 million in punitive damages, plus attorney's fees. Chin ordered attorneys for both sides to appear at a pretrial conference July 11, according to the statement. CNN's Aspen Steib contributed to this report. All About Times Square • Mars Inc.